There were two young women in my hostel dorm last night who set an alarm for 4:15 am – snoozed it twice and took an hour mucking about. Selfish defined. I’m spending the morning having a look around Bath before riding to Amanda’s in Monkton Farleigh – a village at the top of quite a hill not far from Bath. Amanda, you may remember, is one of the members of Tom Bailey’s band – among other gigs. Her steadiest of which is with the Psychedelic Furs, having played with them for 13 years. I’m fortifying for the ride. The good coffee places here, well the one’s I’ve been to so far, are very scientific in their approach – there’s a lot of weighing and measuring. Same with Toby at No 35 Cofffeehouse in Dorchester. It’s good but all a bit fancy and ridiculous. I paid £2.40 (A$5.20) for my macchiato – not worth it. Toby’s was $3.25 – totally reasonable. There’s a dude writing with a fountain pen and a wee pot of ink. That seems very Bath. It’s a hoity-toity place. Beautiful though. – Riding: I cover less territory but see much more. – A big journey is just taking the long way home. This week has felt super long. It was only last Saturday that I was in Southampton … bizarre. I think it’s to do, in part, with being back in an English-speaking environment. I’ve had more conversations, longer and more complicated conversations, this week than I have had in two months. Riding here – getting up the hill is the single hardest thing I’ve done on this trip. I rode out of Bath along the river then climbed up away from the river – up a decent hill. Then there was a bit of flat through a town and across the A4. Then I stared up Bathford Hill, which was tough but rideable – I just stopped a few times. But when I turned into Prospect I just had to laugh when greeted by an incline of 25-30 degrees. It was like that for 150 metres then I turn a corner, and it’s just as steep, for another hundred – but through a forest, it was actually really lovely and quiet as I pushed 5 – 10 metres at a time. Then it shallowed to a rideable angle and I was rolling into Monkton Farleigh– well the edge of it. I found a 13-year-old kid with a sequined marijuana-leaf hat and pierced eyebrow idling in front of newish houses and he directed me towards the pub. And from there I found Amanda’s. I recognised, as I had been pushing my bicycle up that hill that, one, I probably couldn’t have done it two months ago, that I wouldn’t have been strong enough, or maybe wouldn’t have believed I had the strength. And, two, as with so many hard things – if I take my time and do it one bit at a time, I get there. Amanda has a charming little row-house in this crazy cute village. Apparently the area is popular with musicians – Peter Gabriel is over there, a member of Duran Duran in that village, one of the Tears for Fears guys is a native. The views of the countryside from around the village are fantastic. Amanda is … intense and very talkative and interesting. I really like her. This evening a couple of her friends came around and we all went out to dinner then, too, a big looping walk around the village. As we did we passed the Lord of the Manor (really) out walking his dogs. A big proper dog and a little excitable mutt who said hello to each of us before Amanda led him back in the direction of his master who hadn’t broken stride though one of his dogs was lagging way behind. And now I’m settled cosily into my tent, my wee travelling home, down the bottom of her garden. So nice. Some days I’m cruising along feeling good about things and then – bam, defeated. The ride from Monkton Farleigh to Bristol was lovely, and mostly on the paved Bristol to Bath Rail Trail. 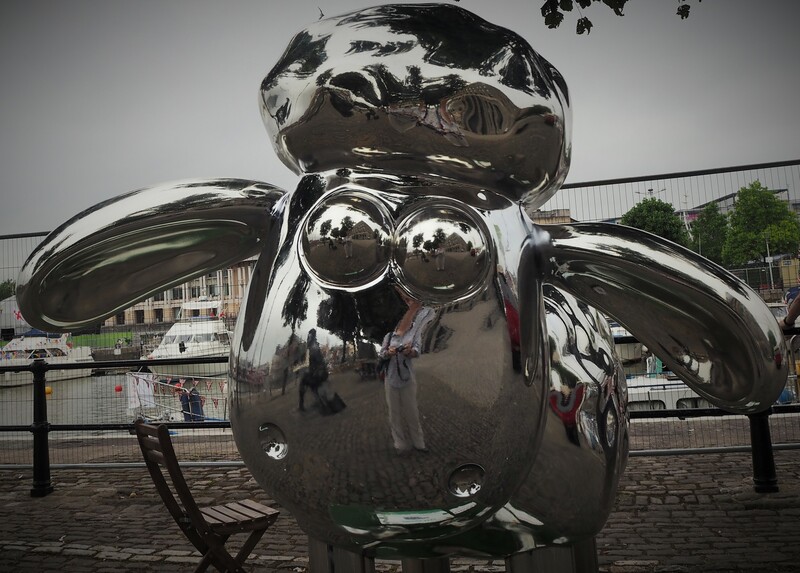 Bristol is multicultural – more Muslim and people of African descent than I’ve seen in a while – and a bit reminiscent of Australia’s Newcastle (working class, revitalised/revitalising, a seaport town). The Harbour Festival was on – masses of people eating crappy food from vans and drinking overpriced beer from tins and plastic cups. The YHA is in the midst of it. I tried to go to the shop – but it was full of festival-goers. I tried to get beyond the chaos but got turned around in Old Town and found myself back in it. I went into a good looking pub with Mac & Cheese on the menu but the kitchen had closed. There’s an older woman in my room who was sleeping when I arrived at 6 pm. She has been in bed ever since. A while ago she stirred to tell me she’d forgotten her PJ’s at the B&B. I’d like to go have a look around but I’m defeated by the crowds and my bad maps. There’s stuff I should do – work, emails, etc. But … just like that … defeated. Grumpy too. It’s still light. There are lots of seagulls circling and cawing. People in a pub are singing. I’m going to read and sleep and hope for revived spirits come morning. I feel like I’m hitting a wall. Not sure if that’s hormonal or just because I know a rest is coming. Or the expense of the UK. Or just the thing of being defeated by Bristol yesterday. Trying to go easy today – I’m out looking at Bristol. This is the first macchiato I’ve had in a long time that I’d describe as, basically, a macchiato. Double shot with a splash of milk and dollop of foam. It’s made with their house roast – which has an edge, but is nice. I’m having a salted caramel brownie too. 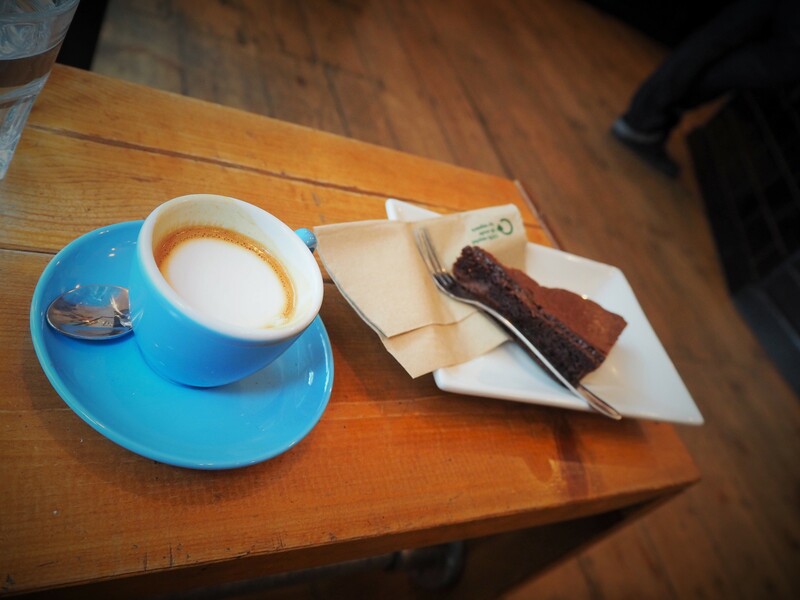 A proper macchiato and a salted caramel brownie. Feeling better for proper caffeine. There’s definitely a funkiness to Bristol it would take much more time than I have to really delve into. But there’s something about it which I like – it has a good energy. I’ve decided to simply take the train to Cardiff today. It’s just that sort of day. Tired. Ready to spend some days in one place. Unpack everything. Wash everything. Get and feel caught up. Feel like I know what’s happening financially. I think all the Warm Showers hosts I’ve stayed with are better hosts than we were, my then-husband and I. I’m always fed. We gave options. In the future I’ll always feed people – it’s so nice. There’s a French family here too. They weren’t scheduled until later but changed their plans and Richard and Iona couldn’t say no. I’m pleased to be in Cardiff, in Wales. I like places where, against all odds, a people have held onto their culture. I’ve done laundry. It’s drying in my room and I can smell it – lovely. Ending the day in a much better head space than I began. Nice.